3. Packing can be 250g or 500g per bundle,inside water-proof paper,outside cotton cloth . a. the bow hair do not include the different color hair, have no the short hair almost. b. The workers pick up 5 times by hand. It has no different color hair and short hair almost. C. The horsetail is uniform, not too thick and not too thin, so the music melody is wonderful! 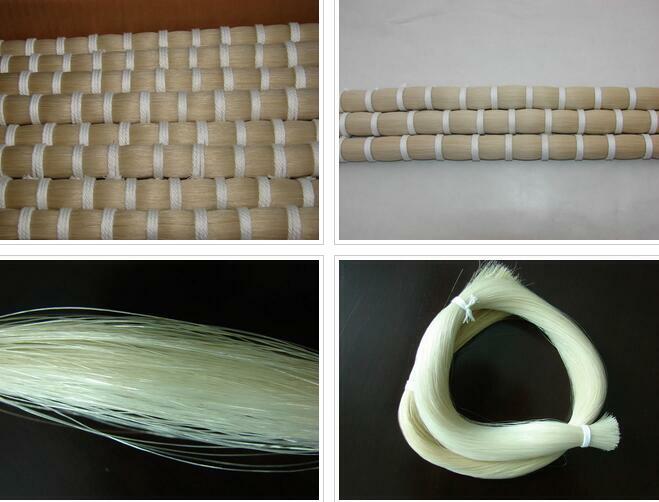 d. the thickness of individual horse hair is between 0.12mm to 0.17mm, high quality bow for violins use. e. guarantee 20% survival after a pull beyond 25mm.